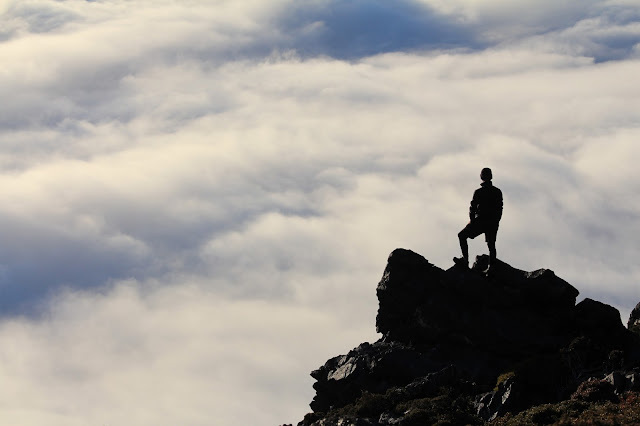 This is when it pays to sleep high – sitting in the sun on a mountaintop, above a thick layer of morning fog. It feels a bit like take off - when a jet planes carries you up into a different world, rising above an overcast city into a bright day where the horizon is a long way off and you know the invisible towns below are colder and greyer and lonelier. 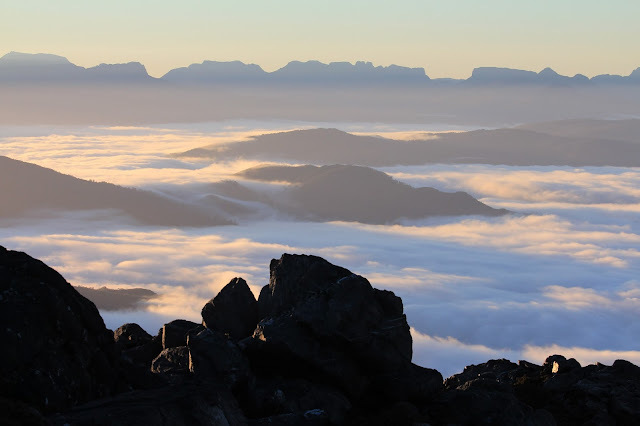 These are my thoughts at dawn, waking on top of Mt Murchison in Tasmania's western region, sitting at 1275m and seeing the cloud curling and lapping below our feet. We had found out about this mountain by chatting to a few locals while at Lake St Clair. Several different people mentioned Mt Murchison and they all insisted it was a walk not to miss. Doing some more research we found inspiring track notes in Bill Wilkinson's excellent book The Abels – "It is an extremely rugged peak with spectacular cliffs and crags." 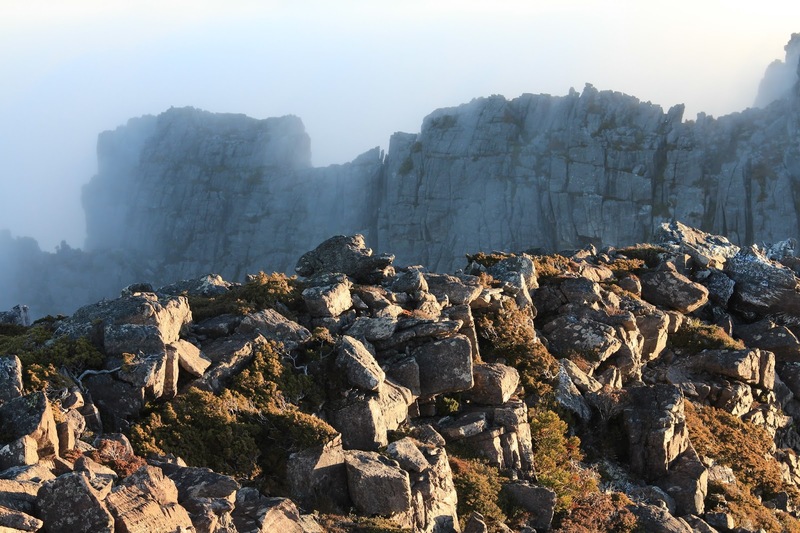 Then some information popped up from a search on the Bushwalk Forum including this comment from Tasmaniac – " I personally think Murcho is equal to or better than any other mountain day walk in Tassie." And so, we had to have a look. 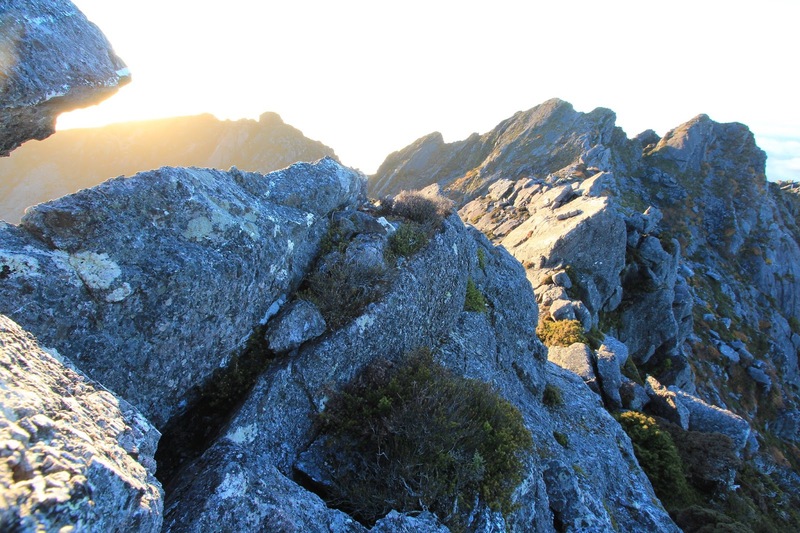 The track to Mt Murchison's summit begins south of the tiny hydro settlement of Tullah. It is sign-posted and there is a small pull-off parking spot, 8.9km along the Anthony Road, from its junction with the Murchison Highway. A set of stone steps, tucked into the rainforest, leads to a National Park logbook. From there, the slippery, root-bound track begins heading up and up and up. The track is easy to follow to the summit but is not an easy walk. Initially we wound up through moss laden rainforest for half an hour before emerging into low alpine scrub where we were welcomed by the bright red, bell flowers of the endemic Climbing Heath (Prionotes Cerinthoides). 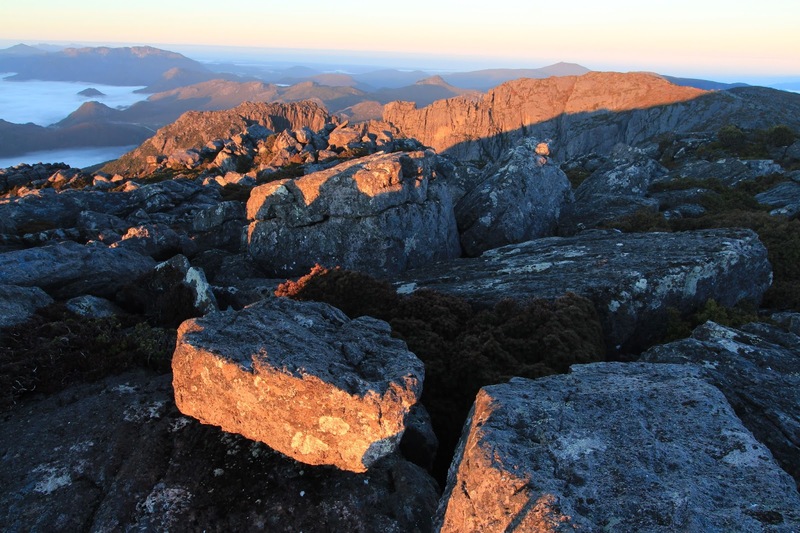 As we continued climbing, we crossed a flat ridge top with good views to the east – Mt Geryon's distinctive silhouette could be seen and in front of that a light dusting of snow was visible on Mt Eros and Mt Hyperion. Closer at hand, and below us, the ridge dropped away to a deep dark lake fed by a waterfall crashing out of the upper reaches of the mountain. Then the climbing really began. First we negotiated a steep, scrambly gully up to a flat point for a short rest with three day-walkers all doing the same; catching breaths and admiring views. Along the track a little way, we filled up with pure, sweet water then climbed up another rocky ramp and a small gully lined with gorgeous yellow fagus. Yet, it seems while writing this that recounting the track route and the stages of the climb gives away nothing of the grandeur and beauty of the walk. We were climbing a place of great beauty with steep cliffs dropping to deep lakes, their black water painted with reflections of grey stone, golden fagus and blue sky. There were views that stretched to rugged ranges in the distance, rocky bluffs and impenetrable rainforests. The trail cut across open, steep sides. There was an airy section across a rocky ledge, a short, open climb up and over a rocky saddle with not a lot of room to manoeuvre. Then, over that gap, we were struck by the amazing inner world of Mt Murchison. 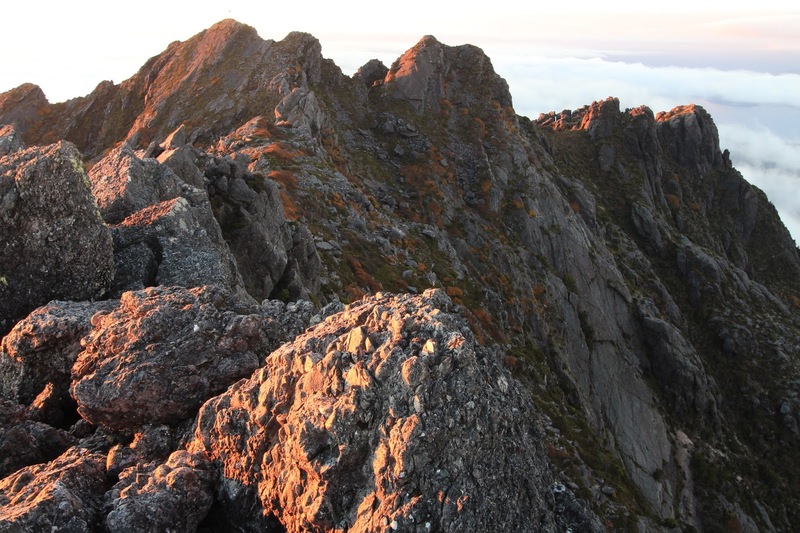 The main mountaintop ridge curls in both directions forming a crest that encloses a deep bowl. 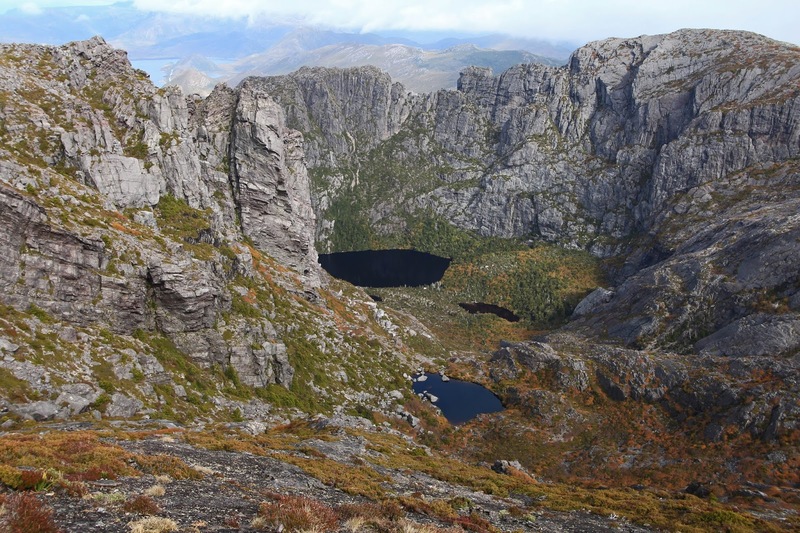 At the bottom of the bowl lies a series of dark lakes stepping down and down through the valley that forms the opening of this amazing cirque. The route to the highest point of the crest was a steep, diagonal path following cracks between huge slippery slabs of sloping rock. It is a small summit too: narrow, rocky and vertiginous. 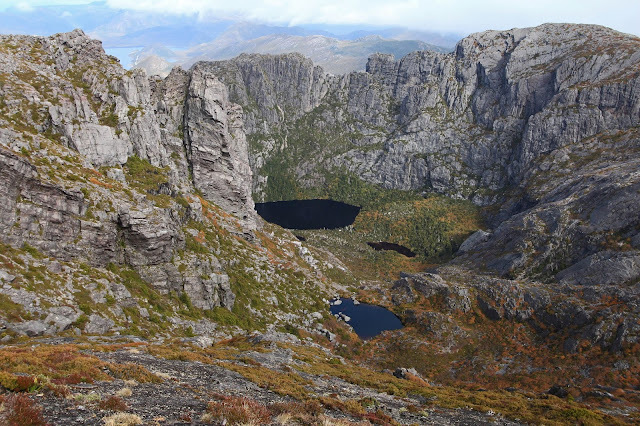 The views, however, were remarkable: in the distance the DuCane Range and the entire length of Cradle Mountain-Lake St Clair National Park cast its profile across the eastern horizon. Up close the edges of Mt Murchison itself were a jumble of bizarre spires, ledges of chunky conglomerate rock and narrow ridges that branched away in all directions. It was high and wild and reminiscent of the best scenery in the Western Arthurs. All the quiet afternoon and into the empty evening, we watched the cloud fog in and out of the cirque and were treated to a golden sunset. As night came on, a sliver of moon rose in the east, a round white shadow, a ghost moon, with a thin illuminated edge. In the morning we woke to that magnificent high bright feeling of being above the world. 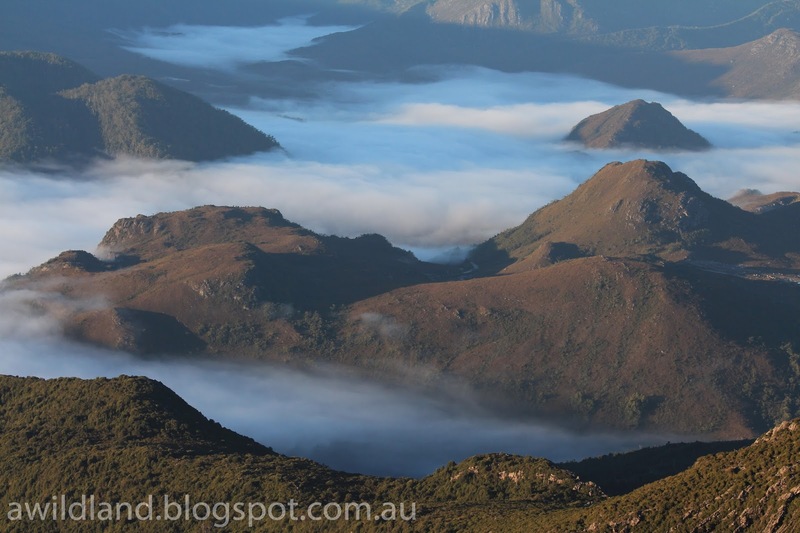 The views to the east again held our attention – the sharp relief of the ranges and peaks, Barn Bluff, Eldon Peak and Eldon Bluff and even Frenchman's Cap further south and the wonderful Tyndall Range close by. The rising sun threw a blast of orange light across the huge boulders of chunky conglomerate rock that make up Mt Murchison then settled in to a softer, paler shade of dawn. So reluctant were we to leave this heaven, we didn’t break camp until 10am. We took our time descending: stopping to admire the views, photograph the flowers and golden fagus, before plunging back into the rainforest for the final slippery climb back down. At the end of his track notes Bill Wilkinson says Mt Murchison is "a truly magnificent Abel and well worth the effort". My notebook from this trip ends on a similar high note – "Just a 10/10 morning and mountain." Inspirational place, Ian! Thanks for reading. Great read and this will be our next walk for sure. Can you give me any clues as to how close to the top you camped and if there is room for a small tent? Planning a very low-impact walk but would like to catch a sunset and rise from the top. Hi Adrian. Thanks for dropping by our little blog page. 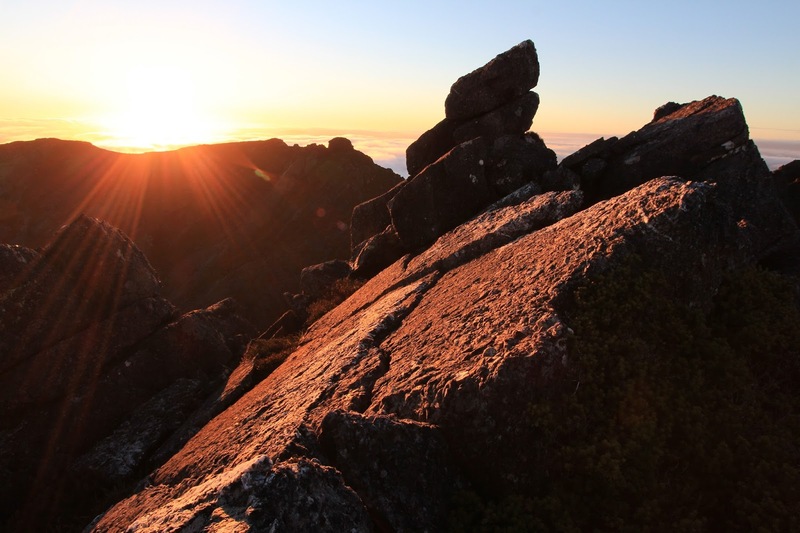 Due to the huge number of similar enquiries about this spot we have decided to invoke a common rule amongst bushwalkers/bloggers to avoid posting detailed information, in the public domain, on accessing sensitive areas without recognised tracks (or campsites). As I am sure you understand, it can easily lead to overuse and degradation no matter how sensitive any of us are about our impact. Thanks again for the nice words about our blog and your interest. Wishing you happy adventuring.